Social Voice – should brands engage in social issues? Blog Social Voice – should brands engage in social issues? How important is it for brands to engage in social issues? Revive investigates, in our latest post. In this modern age, brands are expressing their own opinions on both political and social issues through marketing. Whether it’s supporting causes and influencing on social issues around the globe. The problem is, should they be doing so? Whilst everyone is entitled to an opinion, can a brand truly align itself on both political and social issues without alienating sets of consumers? More importantly, are they simply exploiting issues for marketing and PR purposes? Well, that’s where Revive investigate. We’ve got our hands on a YouGov white-paper, with loads of stats on brands expressing opinions about social issues. In this blog, we look at what the people have to say. We’ll be breaking down the stats behind what Great Britain thinks brands should and shouldn’t do, regarding social issues. Let’s get into it, below. With Brexit looming, the ‘Stop Funding Hate’ campaign and many other social issues, brands are becoming more and more aware of the impact that social issues have on their customers. The white-paper details that following the ‘Stop Funding Hate’ campaign, which called for brands to cease advertising in the Daily Mail (regarded as a right of centre national newspaper). Subsequently, in 2017 Paperchase pulled their advertising from the publication, after mounting public pressure – which impacted the company both positively and negatively. 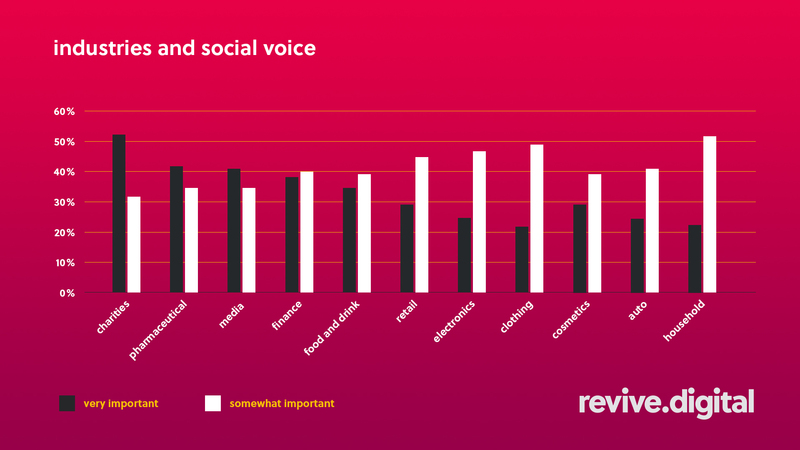 A grand total of 83% (sum of who gave ‘very important’ and ‘somewhat important’) of respondents believed that charities should have a voice on social and political issues whilst the remained 17% deemed it either not as important or not at all. The data presented above is respondents that believe it was both very important or somewhat important. For each industry, over 60% of respondents believed that it was either very important or somewhat important for brands to have a social voice. Whilst some may think that brands are using their position to express the importance of some social issues, others think that brands are using them as a means to an end. Could brands be using important social issues in order to attract more consumers and present themselves in a better light? Is it all a ploy for marketing and PR? See what participants, had to say. Whilst a brand’s true intentions can never be truly understood, it’s worth knowing what people think about brand’s marketing using social issues. 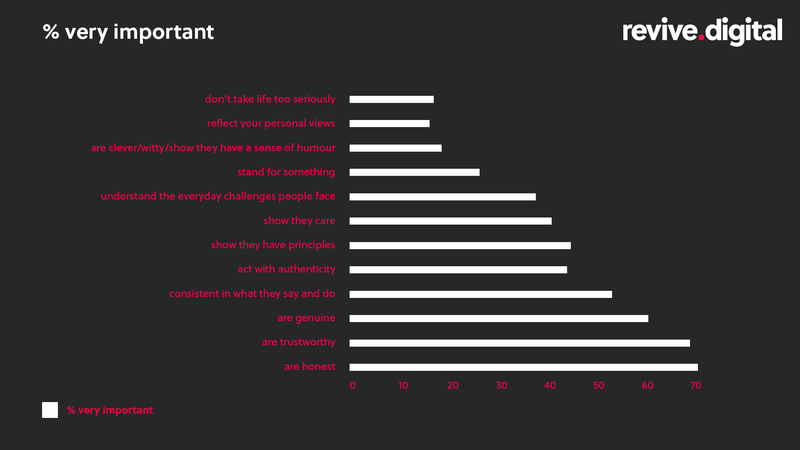 The public want their brands to be transparent, genuine, trustworthy and honest too. Whilst many agreed they should be consistent in what they say and do, as well as have principles – which comes with reflecting their social voice, communicating on social and political issues. A consistent theme throughout the report is the desire for brands to have a purpose – especially when it comes to conveying social and political issues through their marketing. A huge 47% believed it is acceptable for brands to communicate their view on human rights through marketing. Along with 45% agreeing that both animal cruelty and environmental issues (42%) were acceptable to be conveyed within marketing materials and brand messaging. Overall, the full report surmises that 80% of Great Britain believes brands should have clear and transparent standpoints on wider societal issues. So, what can you take away from this blog? Should your brand be engaging in social and political issues? 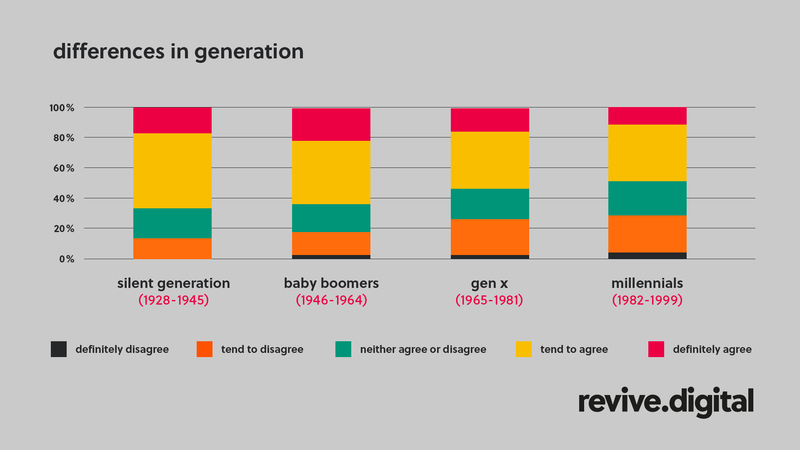 If you’re basing it on who is your target audience for your products or services, refer to graph B. Whilst many of the younger generation believe that brands aren’t using social issues in an exploitative way, many of the older generation do. A great amount of those surveyed believe that it is important for brands to be honest and trustworthy above most other things – so, it may be ideal to communicate honestly to your consumers. As for social issues, it may depend on your values and your businesses’ demographic. If you’d like to discuss branding or marketing, talk to us. We can help you craft an ideal marketing strategy or revitalise your brand for your select demographic.